‘Sharknado 2’ Is Now Crowdfunding For An Extra Scene!! 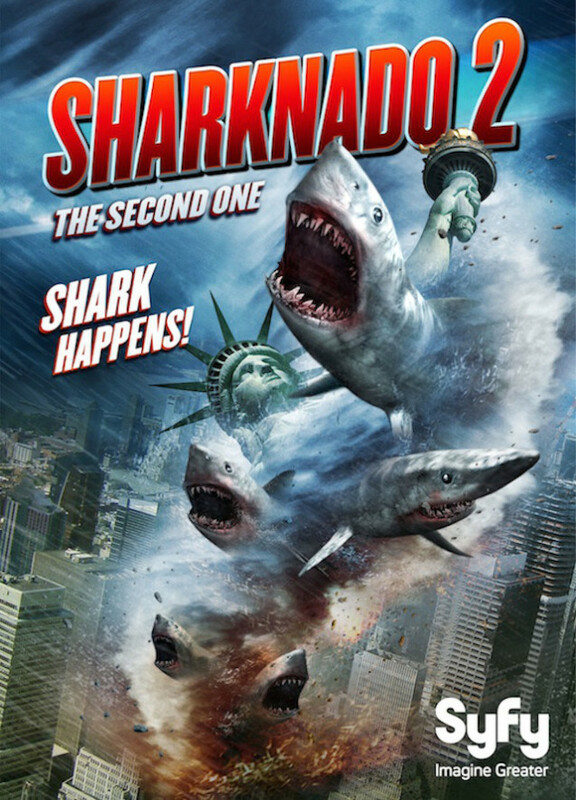 In the upcoming “Sharknado 2: The Second One”, the sequel to “the most culturally relevant film of last year”, the studio “The Asylum” would like to include something special. Unfortunately, they don’t have the funds to make a super bonus scene happen, or so they say. But fortunately for us, the crowdfunding site Indiegogo can help them make their dreams come true by gathering donations from all the Sharknado loving people of the world. To what would your hard earned money go towards you ask? “Sharks, chainsaws, and chainsaws being used in the vicinity of sharks.” Those funding the scene may donate at various levels between $15 and $25,000 and will receive various shark related goods based on your level of donation- including rewards like scripts, shirts, your scream recorded and used in the film, a walk on role, name listed in the films credits, or being flow out for premiere party. My favorite reward has to be at the $45 sponsor-a-shark level where they will “name a shark that appears in the movie after you” and let you know where your shark appears in the film. How cool is that? The donations will be used for the crew and “special effects (specifically sharks, sharks, and more sharks).” They also intend on donating 10% of the proceeds from the campaign to the RJ Dunlap Marine Conservation Program at the University of Miami, which works to save real live sharks and other creatures of the deep. As of now the site has raised a little over $4000 of its $50,000 and has over a month still to go. To see all the rewards and make a donation, CLICK HERE!! This is an interesting development in the whole ‘crowdfunding a movie’ scenario. It seems like ‘Sharknado 2‘ had studio funding because the first film did so well in making national news and people tuning in to watch the ‘so bad it’s good’ shark movie on SyFy. But now the producers want a special bonus scene full of blood, sharks, and chainsaws “for us fans”. Was the movie not going to have this originally? Or is this just something to snag a little bit of more money from the general public and not the studio. That being said, ‘Sharknado 2‘ is still happening and will be released regardless of if this crowdfunding scene makes its goal. We may just not get 10 terrible CG chainsaws in one scene rather than 2. Curious to see if other films only want to fund one scene from their movie from here on out. ‘Sharknado 2’ Has A Cast Now!! ‘Sharknado 4’ Is Coming To Syfy in July!!! Move Over ‘Shark Week’, SyFy Has ‘Sharknado Week’!! This entry was posted on Sunday, April 13th, 2014 at 3:15 pm	and is filed under Film, News, Television. You can follow any responses to this entry through the RSS 2.0 feed. You can skip to the end and leave a response. Pinging is currently not allowed. « You Must Watch This ‘Mad Men’ Blaxploitation Clip! !